Something of the great white whale of current entertainment journalism, the as-yet-untitled Star Wars: Episode VII will no doubt be a source of speculation and rumor right up until its December 2015 release date. There's little wonder in this – despite being less than two years from one of the most anticipated debuts in film history, the movie's production has yet to make a single casting announcement. Many actors have been rumored to be courting or courted by director J.J. Abrams (Star Trek: Into Darkness) for roles in the film, including Benedict Cumberbatch, Matt Smith, and Chiwetel Ejiofor. 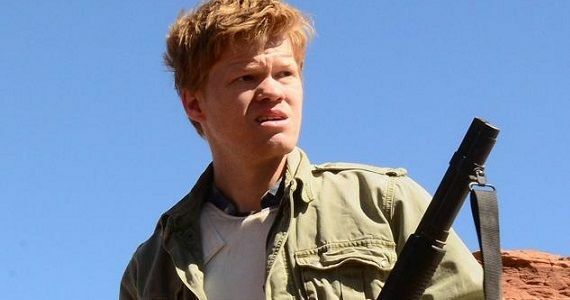 Now, a somewhat surprising actor is said to be in heavy contention for one of the headliner spots in Episode VII – Jesse Plemons, best known as the dopey-yet-murderous Todd on Breaking Bad. The Wrap asserts that Plemons is being strongly considered for a lead role in Star Wars: Episode VII. Apparently, Plemons has already submitted a well-received recorded audition to the production and has been asked to return to do a live audition for Abrams. The report has gone unconfirmed by anyone directly involved with the film's production, and the exact role Plemons has auditioned for is unknown. While not a widely known star, the comparatively young Plemons is a seasoned actor who has been acting on film and TV since he was 10 years old. While he may currently be best known for his work on Breaking Bad, Plemons broke into television in a big way with his recurring role as Landry Clarke on Friday Night Lights. He has also put in side-role turns in movies such as Observe and Report, Paul, Battleship, and The Master. Though it's slightly odd to consider that an actor primarily known for television work may soon headline a Star Wars film, Plemons could be an interesting and able choice. In his turn as Todd on Breaking Bad, the actor managed to convey both puppy-like naiveté and genuinely creepy, depthless sociopathic behavior. Considering this, one has to wonder what kind of character Plemons is being considered to slip into for Episode VII. Deployed as a villain, his charm and boyish looks could provide an antagonist very different than any yet seen in a Star Wars movie. As a hero, those same attributes could help build a lovable space rogue in the mold of Han Solo. Thus, my long-shot choice for the role: How about a son of Solo? Even if Star Wars: Episode VII abandons the brood of Solo children from the Expanded Universe's multifarious properties, a child sired by Han and Leia could provide a solid link between the old and new guard of the Star Wars film universe. With his hair mussed, Plemons definitely has a young Harrison Ford sort of look to him. Will he soon be plying the spaceways with a new generation of scoundrels? All such (completely baseless) speculation aside, Plemons' potential casting is fairly exciting news. It indicates that Abrams is willing to look to nontraditional sources for talent – something that George Lucas himself definitely did for the original Star Wars. We at Screen Rant will be keeping a close watch on this rumor to see just how it plays out. Star Wars: Episode VII will arrive in our galaxy on December 18th, 2015.